Limousin, a region made up of the three contrasting Départements of Creuse, Corrèze and Haute-Vienne, can make a strong claim to be called the heart of France. It is a region too often neglected by visitors, This page is intended to whet the appetite, and to persuade the reader to go and see the reality as soon as possible. Limoges is special for a number of reasons. It has, for a start, quite the most beautiful Art Nouveau railway station in France, the pendentives of whose dome are adorned with figures (left) representing the regions its railway serves. The streets of Limoges are home to a fleet of trolley-buses, an ecologically sound method of transport taking advantage of the hydro-electric resources of the Limousin. Limoges still produces, in vast quantities, its own most famous artefacts in porcelain and enamel. The enamel-workers were organised well before the sixth century, but it was the discovery of a bed of china clay in 1770 which permitted the foundation of a porcelain industry to rival Sèvres and Meissen. The old bridges of Limoges (Pont Saint-Martial right) are the pedestrianised centres of an ancient city. A city of mystery and legend, with an underworld all of its own; tunnels, older than the Romans, from hilltop to riverside; a whole subterranean town of several storeys, and an inexplicable spherical underground temple are among its many ancient remains. Of the three Départements which make up the modern region of Limousin, the Creuse is the odd one out. Before the Revolution, Limousin meant the area now covered by Corrèze and Haute-Vienne, while Creuse was the province of La Marche, the borderland between the bare Massif Central and the fertile Loire Valley. It is the source of many rivers beside the Creuse itself: Cher, Vienne, Vézère, they run in deep gorges amid the ancient forests. The main town of Creuse is Guéret, still neither large nor heavily industrial. La Souterraine (left) retains its ancient walls and its ancient peace. The Lake at Vassivière is artificial, created by damming the river Maulde. In the month of June, the hillsides all around were bright yellow with the flowering broom. At Whitsuntide a National Regatta is held here, and in early July a Gastronomic Festival of freshwater fish. A scenic road, rejoicing in the name of Route Circumlacustre, offers lots of spectacular views, and a footpath leads across a bridge to an island with an open-air museum of modern sculpture. Lac de Saint-Pardoux (right) is altogether more peaceful and remote. A pretty little town centred round its old bridge, from which there are views over the weir with its two water-mills and the houses of the Old Town, perched on the steep slope above the river, each with its balcony, loggia, gallery or verandah. At the top of the hill the Chapel of Notre-Dame-des-Bancs, sole remnant of the original castle, is surmounted by a twenty-foot, three-ton gilded statue of the Virgin and Child. The best way to approach Argentat is from the South, where the view across the Dordogne to the town is about as picturesque as you’ll find. There are houses of every shape and size, with dormers, gables, pepperpot towers, balconies and terraces; roofs of tile, slate or lauzes, thick, grey, lichen-covered slices of volcanic rock. In the summer there are flowers everywhere, red and white, and the tables outside the Auberge des Gabariers (left) are the ideal place to spend a sleepy afternoon. The Gabariers were the men who built and sailed the Gabares, vast clumsy boats of wood from the local forests, which took the produce of the upper Dordogne downstream to Libourne and Bordeaux, where the boats themselves were dismantled and sold to timber merchants. The Dordogne, throughout history an unpredictable though beautiful river, is nowadays tamed to a large extent by a series of dams at Bort-les-Orgues, Marèges, L’Aigle, Le Chastang and Argentat: six more dams regulate its tributaries. They provide water for irrigation in summer, and electricity in winter. The power station at Le Chastang produces more electricity than any, though its lake is only the third biggest on the river. On a rocky spur enclosed by a narrow loop of the river Maronne, deep in the forests of Corrèze, stand the ruins of a fairytale castle. Or rather, of seven castles, since from the 12th to the 15th century each successive heir of the local Barons built himself a new keep alongside the old. Inaccessible on its high rock, the fortress defended the frontier between Limousin and Auvergne until the coming of artillery rendered it suddenly and totally useless. Nothing, however, could make it less romantic. In the south of Limousin, the massif of Les Monédières has had a fiery history. Julius Caesar, out of patience with the local Resistance, burned the forests over a period of several months. Medieval monks patiently replanted the trees a thousand years later, but in the 16th century its owner, Baron Louis de Pompadour, burnt it all again to drive away the invading Huguenots. In pretty villages like Chaumeil a few ancient stones remain; from the height of Suc au May (right) the progress of reforestation can be observed. If you have a house in Uzerche, you have a castle in Limousin, they used to say; and indeed the houses of Uzerche seem to have more than their ration of turrets, battlements and machicolations. At the top of the hill the fortified church of St. Peter has portions dating from the 11th, 12th, 13th and 17th centuries, surmounted by a 12th-century tower typical of the region, built in four storeys, the top one octagonal and the bottom three square. Opposite the church, the town hall boasts a handsome statue of Marianne, spirit of the Republic. Architecturally, this is a département of contrasts. In the West the buildings are opulent, sophisticated, neatly crafted. Châteaux like Montbrun (left) and Rochebrune (centre), surrounded by moats, are at once powerful – Montbrun repelled even Richard the Lionheart – and elegant, courtly and aristocratic. 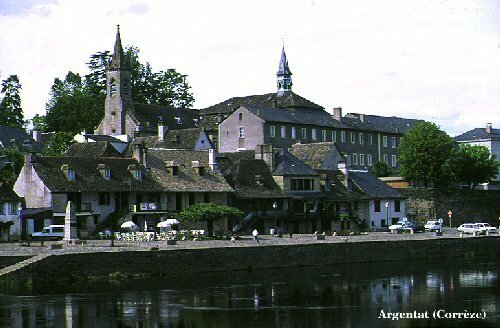 In the south as at Coussac-Bonneval (right), the stone is rough, the buildings simple, their purposes humble, popular, rooted in superstition. The tower in the picture is a Lanterne des Morts; there was a pulley inside with which to raise a lantern to commemorate the dead and act as a landmark to the living. In the North of the Haute-Vienne, overlooking the plain of Charente, the last hills between the Massif Central and the Atlantic are the gently-rounded Monts de Blond. The hills are wooded, and in the depths of the forest there are megaliths, stone crosses, hermitages and curiosities such as the rocking stone (right). The main town is Bellac (left), birthplace of Jean Giraudoux, a town recently cleaned, polished and pedestrianised and still a little raw from the experience. To the east, Le Dorat preserves its fortifications and the amazing pile of the Collegiate Church of Saint Peter. This building dates in its entirety from the years 1100 to 1150, a mass of chapels, buttresses, turrets and arcades, with for good measure a watch-tower, part of the town wall, firmly attached to its eastemmost end. Here is a town both ancient and modern, historic and industrial, whose story goes back to the dawn of time. The main trade route from Bourges to Bordeaux, a road dating back perhaps three thousand years, crosses the Vienne here. In the 12th century it became a staging post on the pilgrims’ route to Compostela. The village of Noblat was always prosperous, always open to the wider world; its houses are of every period and every style; half-timbering rubs shoulders with neo-classical, gothic with romanesque. Saint Leonard himself was a very special person. He was the godson of Clovis, first Christian King of the Franks – his nobility gave the village its name of Noblat. When his prayers saved the Queen from dying in childbirth, he chose as his reward a hermitage in the nearby forest where his miracles were of special benefit to barren women and, incongruously, horses. After his death Saint Leonard went on working miracles, of which the most famous took place in the 16th century. Martel de Bacqueville, taken prisoner by the Turks, prayed to Saint Leonard from his cell and awoke the next morning to find himself still in chains, back home in his French forest. In memory of this, Leonard became the patron saint of captives and is always represented with locks and chains. Every November on his feast day a wooden castle representing a prison, is ceremonially destroyed by mounted knights armed with maces. Another famous native of Saint-Léonard-de-Noblat was the scientist Gay-Lussac, after whom the main square is named. As might be expected of a town with its own saint, the church at Saint-Léonard is a particularly splendid building. Its tower (left), whose base forms an open porch, is six storeys high, the first four square, each side an open arcade, each storey narrower than the one below. Pointed gables on the fourth storey create a transition to an octagonal upper section surmounted by a stone pyramid. Next to the tower is a round, domed baptistery, and the church itself has three domes over the crossing and the transepts. The whole thing dates from the 12th century, though it wasn’t finished until the 13th. I like it a lot. This must be the perfect example of a village to the South of Limoges. The church has, in the place of a tower, a Clocher-mur – a solid wall with holes for the bells. The old houses (right) show all that evidence of gentle and harmless decay for which French villages are known and loved. The Café Terminus appears to have lived up to its name many years ago. Saint-Priest sits in a well-wooded countryside of rolling hills, where the sun-loving Limousin cattle graze in small green meadows. For an article about an estate near Saint-Priest, see Freyssinet. Tobacco ration day. All is calm. 2.00pm. : a detachment of the SS Das Reich division encircles the town. 3.00: all the inhabitants are assembled in the market place. 3.30: nearly 500 women and children are shut in the church, the men in the barns. 4.00: an explosion. The massacre begins. 7.00: 641 dead including 205 children. 318 buildings destroyed. Here time has stood still so that you may remember. A few details, however, can be added: First, this was not a reprisal. Oradour was chosen for massacre because it was not a centre of resistance. The SS, departing for Normandy, wanted no uprisings behind its back. Second, most of the SS who destroyed Oradour had been recruited in Alsace since 1940, and were French by birth. Third, because this was tobacco ration day and the schools worked Saturdays, the town was full of people from the surrounding countryside; thus the number of victims at Oradour was a third higher than the population. Fourth, the average age of the SS men was 17. 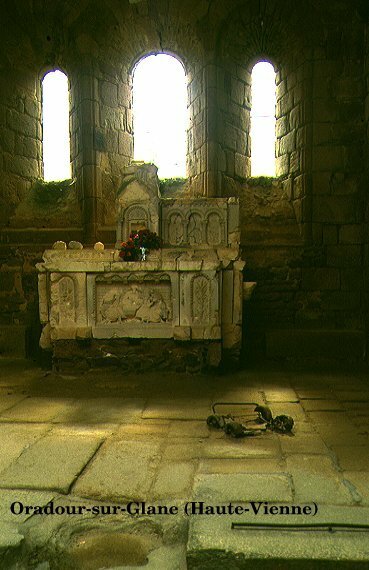 In the crypt of the memorial at Oradour, some of the unbumt possessions of the dead offer mute witness to the horror of the day. When the schools burned, for example, only the inkwells survived. The guide in the church shows the bell, melted by the heat of the fire; he points out that the push-chair by the altar is only one of fifty. If you want harrowing details, he is the man to give them. For me, though, it is the family memorials in the cemetery, personal and direct, which most immediately touch the heart. If I had to choose one village in France to live in for the rest of my days, I think it might well be Mortemart. It is on the list of the Most Beautiful Villages in France; it is off the tourist track but placed among the Monts de Blond between Limousin and Périgord in the most beautiful countryside in France. Above all, it is stunningly, unbelievably beautiful. Louis XIV’s mistress, Mme. de Montespan, was a member of the Mortemart family. Her sudden prosperity is reflected in the magnificently overdone baroque decoration of the church, though she had the sense not to remove the 15th-century choir stalls with their carved misericords. There are two old convents, a splendid timber market hall and lots of picturesque old houses. 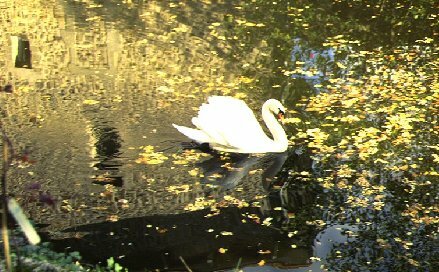 The Château, partly ruined and hastily roofed over, watches its reflection in a mirror-still moat, and everywhere there are flowers and greenery and golden stone. I have a theory that the colour scheme of Versailles – green and gold – was suggested by the stone and verdure of places like this, the core and centre of France.